The historic 1540-1542 expedition of Captain-General Francisco Vasquez de Coronado is popularly remembered as a luckless party of exploration which wandered the American Southwest and then blundered onto the central Great Plains of Texas, Oklahoma, and Kansas. 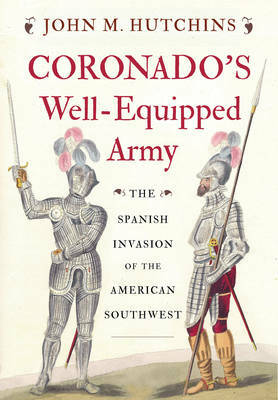 The expedition, as historian John M. Hutchins relates in Coronado's Well-Equipped Army: The Spanish Invasion of the American Southwest, was a military force of about 1,500 individuals, made up of Spanish soldiers, Indian warrior allies, and camp followers. Despite the hopes for a peaceful conquest of new lands-including those of a legendary kingdom of Cibola-the expedition was obliged to fight a series of battles with the natives in present-day Sonora, California, Arizona, and New Mexico. The final phase of the invasion was less warlike, as the members of the expedition searched the Great Plains in vain for a wealthy civilization called Quivira.While much has been written about the march of Coronado and his men, this is the first book to address the endeavor as a military campaign of potential conquest like those conducted by other conquistadors. This helps to explain many of the previously-misunderstood activities of the expedition. In addition, new light is cast on the non-Spanish participants, including Mexican Indian allies and African retainers, as well as the important roles of women to the expedition.